Founded in 1961 as Bower & Fradley, our boutique roots paired iconic design and exemplary management. The foundation of our firm is represented by these “classics” which play a role in the work we do today. Services began with studies of three sites within the academic core to accommodate the Mod 6 chillers. Boeing Helicopter's R&D and Manufacturing plant was expanded through the addition of a new 200,000 square foot building, which is interconnected with existing facilities to form a complex of executive, administrative, and research office space. For a quarter century, BLT Architects guided the expansion and renovation of the Baltimore Museum of Art housed in a magnificent, classical 1927 building by John Russell Pupe. The first phase in the revitalization of the city's central eastern commercial artery, Gallery I is a sky-lighted, climate-controlled retail mall extending between 8th and 10th Streets along the north side of Market East. Client Redevelopment Authority of Philadelphia & Rouse Co. These townhouses, 50 total, were designed following the firm's winning submission in a competition for designer/developer teams to design two groups of single-family homes in the Society Hill area of Philadelphia. Client Penn Towers Development Corp. 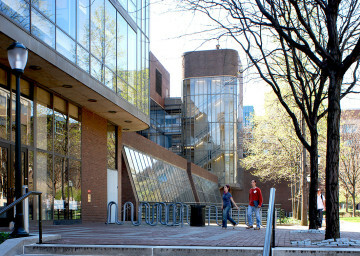 This 98,000 square foot classroom building sits opposite the entry to Penn's landmark Memorial Towers gothic dormitory complex. 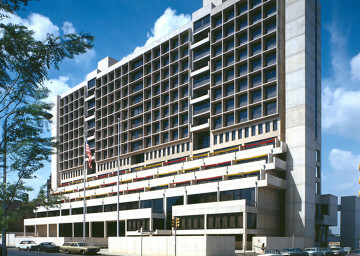 International House is a residential, educational, and social center in the University City neighborhood of Philadelphia that serves college and graduate students of all nationalities. This 21-story tower doubled the rentable floor area of an office high-rise designed by Ritter & Shay for Drexel Company in 1928.